As a dog owner, there is a pretty good chance that you’ve stumbled across the Nutro brand at some point or another. The brand has quickly become well-loved among the dog owning community and this is no coincidence. 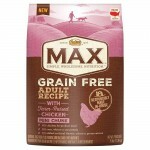 They make some of the best dog foods out there. Below, you’re going to learn more about Nutro Products and some of the company’s very best dog foods. Everyone on planet earth has enjoyed food from Mars Incorporated. Well, the company actually owns Nutro. This should give you a little peace of mind. 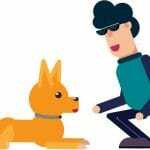 You can guarantee that Mars is going to go above and beyond to ensure that its Nutro line of dog food is going to satisfy the customer and their dog. If you trust and respect the Mars brand, you can trust and respect Nutro too! 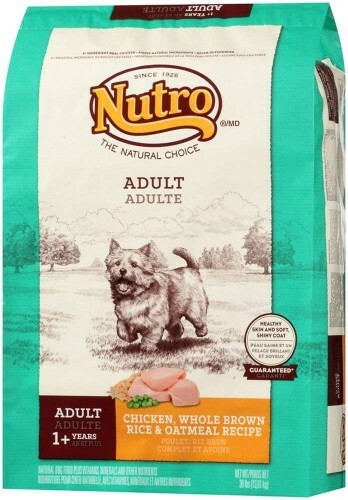 You’ll also be happy to know that Nutro Products Inc. is an America brand. The company was originally founded in 1926. At that time, it was based out of Industry, California. Since then, the company moved its headquarters to Franklin, Tennessee. 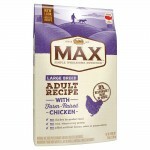 This American brand has been manufacturing great dog food for many, many years. Nutro Products has quickly become one of the leading dog food manufacturers in the world. The company’s growth sped up significantly after it was acquired by Mars in 2007. Today, the company serves consumers from all around the world. Their products are available in several countries, including the United States, Australia, New Zealand, Asia, Europe and Canada. Finally, you should know that Nutro offers plenty for you to choose from. Is Nutro dog food good? Yes, and the company also sells cat food. They make a little of everything, including canned food, soft food, and dry kibbles. No matter what you’re after, you can guarantee that Nutro will have something good for you and your dog! 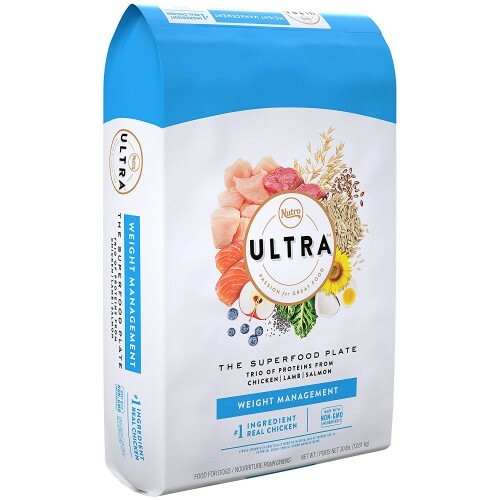 When you begin reading Nutro dog food reviews, you will quickly see that the ULTRA Weight Management Food is one of their most popular products. This food is ideal for those obese dogs that have a tough time controlling their appetite. 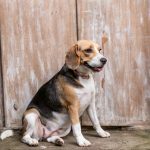 The food will ensure that your dog is able to get the nutrients that he or she needs, without causing them to pack on the weight. The food is available in various sizes, such as 8 pounds, 15 pounds and 30 pounds. You can also choose between small breed adult and adult styles. You’ll also be happy to know that this food contains only the highest quality ingredients. For instance, your dog will be able to enjoy coconut, kale, blueberries, and chia. You’ll never have to worry about your dog eating corn, chicken by-product, or any artificial flavors, colors or preservatives. With this food, your dog is only getting the best of the best. All in all, the Nutro Ultra Dog Food is great. However, it might not be accepted by picky dogs. Of course, this is true with a lot of dog foods. There are plenty of great foods out there, but there is something unique about MAX. The food is only available in two sizes, but they’re going to satisfy most. At the same time, this food is made in the United States. That should give you a little peace of mind. When you read Nutro Max Dog Food review, you’re going to see that this food has been specifically designed to meet the dog’s nutritional needs. This food doesn’t contain any artificial flavors or preservatives, which could be harmful. Another great thing about this food is the fact that it is available in so many different flavors. You can choose between chicken, beef and lamb. At the same time, there are mini chicken chunks for small dogs and a large breed variety as well. This food is great for dogs of all shapes, sizes and ages. This food isn’t for all dogs. Nevertheless, it’ll make a great choice for many. If you want to avoid those harmful ingredients and your dog doesn’t have any allergy problems, this food is well worth checking out. If you’re looking for a great dry food for your dog, you’ll definitely want to check out Nutro Wholesome Essentials. Read several Nutro reviews and you’ll see that this is one of the most recommended foods from the company. The food is available in three sizes, 5 pounds, 15 pounds and 30 pounds. It is also nice to know that this food is going to provide your dog with plenty of Omega 3 and 6 fatty acids. That ensures that their skin and coat are going to remain soft, shiny and healthy! This food doesn’t contain any genetically modified materials. It might have some trace amounts, but that is minor and nothing to worry about. Instead, this food is going to provide your dog with everything they need to be happy and healthy. For instance, your dog is going to receive essential antioxidants, Omega 3 and Omega 6 fatty acids. This food is great for keeping your dog healthy. The Nutro Wholesome Essentials Food is great, but some dogs will have a tougher transition than others. Just take it slow and introduce it to your dog slowly. Do that and you’ll both love it! The Nutro Natural Choice is a great dry dog food. This food is designed to ensure that the dog remains healthy. 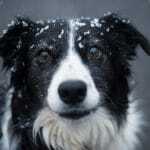 After all, it delivers plenty of antioxidants and helps to keep the dog’s immune system in excellent condition. 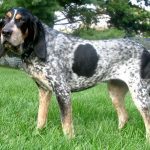 This food is also guaranteed to improve the skin and coat. The food contains oatmeal, which is going to help with the digestion process. This food is versatile and great for all aspects of the dog’s health. This food’s number one ingredient is farm raised chicken. The chicken has been raised in the United States. You can guarantee that this good is going to provide your dog with everything they need and then some. NUTRO Natural Choice Dry Dog Food is ideal for all breeds with sensitive stomach and skin. The ingredients derive from natural sources. The kibbles are a perfect size, so they are very easy to chew, even for smaller breeds. It smells great, which is always a plus for picky eaters. 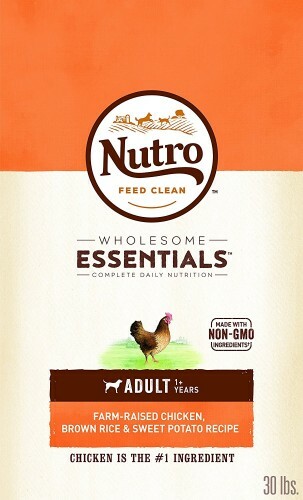 The NUTRO brand has a reputation of providing its customers with high-quality dog foods. The company does not utilize fillers just to cut costs. In fact, all of the ingredients are listed on the bag of the bag, which means nothing is hidden from the customer. 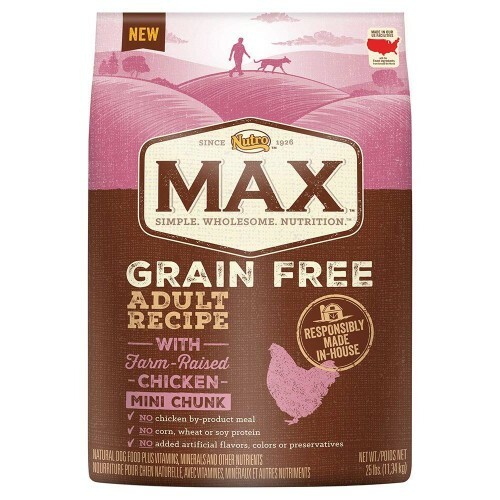 NUTRO Max Natural Dog Food does not contain grain, chicken byproducts or artificial flavorings. So, when you feed your dog this food, you will be filling his tummy with nothing but nutritious goodness. The NUTRO Max Dog Foods comes in mini chunks, making it ideal for small breeds. It is also suitable for older dogs with missing teeth. Each chunk contains ingredients derived from natural sources. This food will provide your pet with the proper amount of nutrients and vitamins to keep them healthy and active. 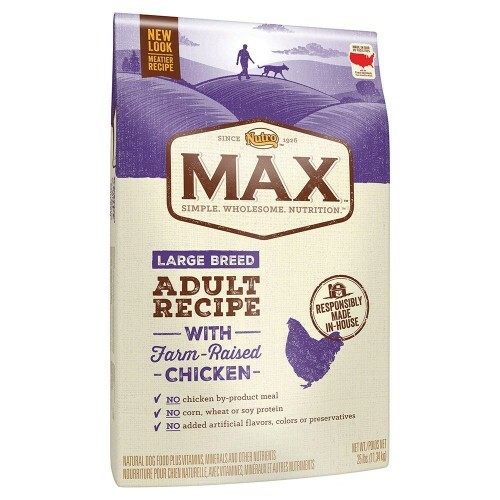 The NUTRO Max Natural Adult Dry Dog Food is ideal for all breeds, especially small. The small kibbles are very easy to chew, making it the perfect size for aging dogs with poor teeth. While the need for some of the ingredients is questionable, they are derived from natural sources. So, they pose no health risks for dogs.